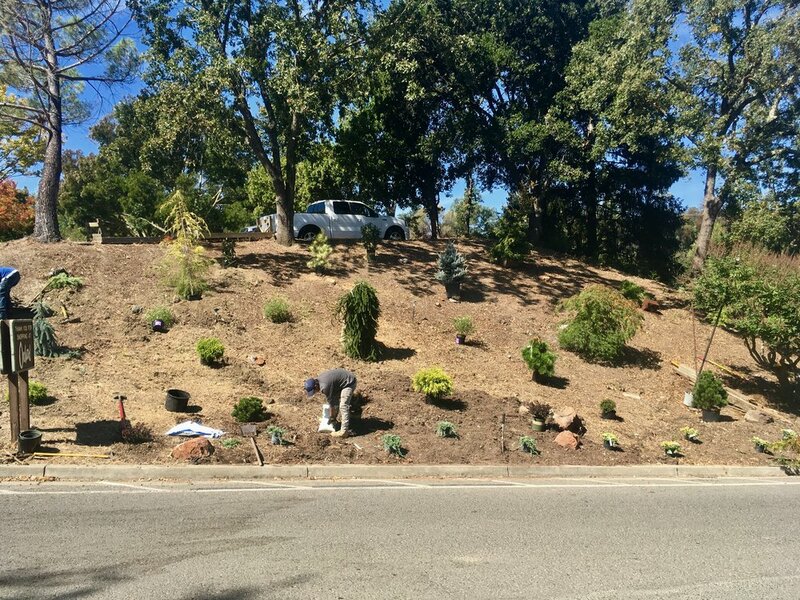 Wondering what we're up to on our hillside? We’ve been waiting for the opportunity to re-landscape and now that it’s fall, it’s the perfect time to plant! Fall is the best time for planting just about anything and everything. Warm soil helps roots take hold and establish themselves while winter rains water in the plants for us! Before...and our progress so far! We have chosen statuesque conifers and placed them dependent on size, color and texture. Our taller conifers have been strategically placed in the back while low-growing junipers, like our ‘Mother Lode’ variety and Jakobsen Mugo Pine are planted in the front. To create focal points that draw the eye, dark and light colored foliage have been paired. Notice a few Crimson Ruby Japanese Barberry among electric evergreens. It’s easy to find conifers to plant among perennials to create a cohesive and lush garden. We have chosen perennials like Salvia and Lavender Lady Lilac (Spot it at the top of the hill!) to complement these stately gymnosperms. Golden Mop Threadbranch Cypress and Crimson Ruby Japanese Barberry. Upon planting we’re amending the soil with Master Nursery’s Gold Rush. A natural ground fir bark blend with 15% composted chicken manure, this adds vital long-lasting organic matter to the soil improving both soil aeration and water penetration. Our tools for garden goodness! Luke and Jacob working it! For each new planting, Master Nursery's Iron Plus is applied to encourage healthy foliage and new growth. Any plant would benefit from Iron Plus, its blend of iron and sulphur keep leaves nice and green while a mix of micronutrients help with nutritional uptake. We’re also applying Master Nursery’s Master Start 5-20-10 to aid in our plant’s root development. A vigorous root system enables the plant to absorb water and nutrients critical for foliage, flower and fruit development. High in phosphorus, we recommend feeding all your newly planted ornamentals and lawns Master Start to aid in healthy growth. Stay tuned, we’ll be updating you on our next steps and how the hillside is filling out! And be sure not to miss our sale starting this Sunday, October 1st thru Saturday, October 7th, shop 30% off conifers for this limited time only! For more information, stop in and be sure not to miss Sara of the American Conifer Society and our very own Luke Vaughn at our Harvest Festival this Sunday, October 1st as they discuss why conifers are a high impact addition to your landscape!